At the end of the day, if you publish content, your goal is to be read. Otherwise, what are you writing for? 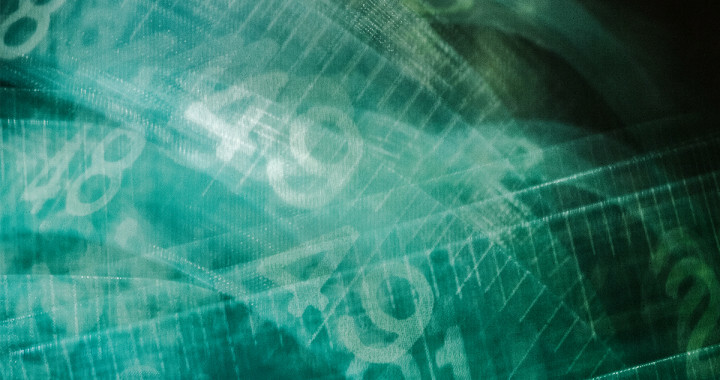 If you publish, odds are that you also share that content on a social media account. How are you tracking your impressions earned with this? Various social media services can give you engagement and clickthrough rates, but with the power of Google Analytics, you can actually see how your visitors from individual social media services browse your site. The ‘Campaign’ feature is something we can use to get some insight into these measurements. Google has a pretty helpful doc on the different aspects of their Custom Campaign attributes. In short it uses query string parameters to help Google Analytics track how your visitors arrive. Query string parameters are parts of the URL that look like ?utm_campaign=xxxxx&utm_source=xxxx. 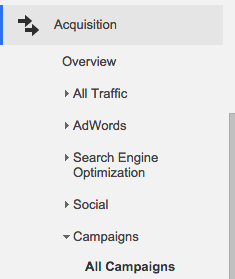 When these are defined, we can go into our Google Analytics dashboard, and under the ‘Acquisition’ menu we can use the ‘Campaigns’ section to view any of the variations we’ve provided in our Custom Campaign URLs. 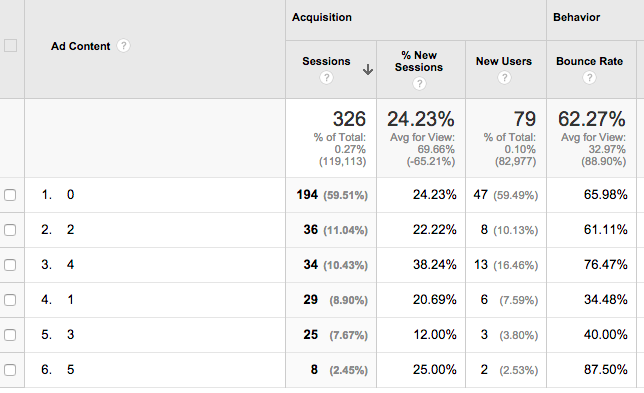 Alone, Google Analytics will give you quite a bit of information about how people arrive at your site. Where campaigns come in though, is when you use any sort of advertising, promotion, or content marketing. Say for instance you run an ad on Facebook, or Twitter. Instead of just knowing people followed your link from one of those platforms, when providing the URL for your ad, include some of the query string parameters to build a custom campaign URL, and really see the results of that paid ad. Want to build a Custom Campaign URL now? Google has created a Campaign URL Builder to help. The Post Promoter Pro settings for analytics tracking. After clicking ‘PostPromoterPro’ from the campaigns, it breaks down your social networks. With statistics like this, we can help identify how successful our campaigns are on specific networks, and which types of content our different audiences react to. So since Post Promoter Pro also shares across multiple days, it uses the ‘utm_content’ tag as the different times a specific post was shared. This helps us track down our ideal number of times we should share a post after it’s published, before it’s run it’s course and worn out the audience. You do this by selecting a 2nd measurement. 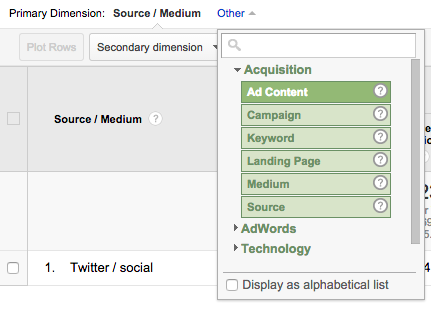 First select the ‘Other’ link and choose ‘Ad Content’ from the Acquisition group. What we are left with is the collective results of all shares from Post Promoter Pro, on Twitter, and their impact as time goes. Results broken down by the share counter. The `0` value is the first time a post is shared, when publishing. `1` is the 2nd time it’s shared, and so on. You’ll see that with this site, it’s been shared up to 6 times for some posts. You’ll also notice that the most popular times for these campaign links to be clicked on the 1st, 3rd, and 5th shares. Using this information, we can break down the most successful times for us to share content, with this site. As the quote above says, if you don’t measure, how do you know where to define success. Using Google Analytics to monitor your efforts can help you define goals and then work towards them. Hey, my name is Chris Klosowski, a WordPress plugin developer based out of Queen Creek, Arizona, and the developer of Post Promoter Pro. I am also a Lead Developer for Easy Digital Downloads, a complete eCommerce plugin for selling digital products through WordPress, as well as a WordPress core contributor. I focus mainly on eCommerce and social media-based plugins, but love building small utility plugins when the need arises. Fix: Corrected an issue causing Facebook to lose it's connection and not allow picking pages. Fix: Facebook: Removed 'Me' as an option for where to publish as Facebook no longer supports this. Fix: Corrected some issues with PHP 7.2 compatibility. Fix: Allow the Local URL admin notice to be permanently dismissed. Fix: Deleting user meta wasn't being called correctly. Fix: Further stability to the Twitter oAuth process. Fix: Resolved an issue connecting Twitter accounts. Fix: Resolved an issue that caused scheduled share to not be scheduled. Fix: Corrected an issue related to Pinterest data when saving a post. Fix: Prevent share logs from showing in front end search and queries. Fix: Verify the Pinterest settings are present before saving. Fix: Corrected incorrect HTML markup in the Pinterest metabox. Fix: Better compatibility with saving Post Promoter Pro content when saving posts created with page builders. New: Added support for alt-text on Twitter Card images. New: Added ability to assign 'Share on Publish' defaults on a per-post type basis. New: Authors can now opt-in to Retweet any initial or scheduled shares. New: Added ability to define a Pinterest image for Open Graph. Fix: Improved the detection for staging sites. Fix: Attempt to not load Font Awesome if it is already included from another source. Fix: Set capability required for Post Promoter Pro settings to 'manage_options'. Tweak: Added a 'Refresh Access' button to the Account list table. Fix: Possible issue loading translation files when directory has been changed. Fix: Incorrect spelling of function name. Tweak: Corrected a reference to 140 characters for Twitter. New: Support Twitter's new 280 character count. New: Prevent sharing when a development or staging site is detected. Fix: Do not show Twitter section on profile editor unless main Twitter account is connected. Fix: Make the CSS Selectors more specific. Fix: Prevent possible duplicate scheuled share from being sent. New: When a post is published or updated (after being published) send a request to Facebook to clear the Open Graph cache. Fix: Schedule view and dashboard widget using default text instead of custom text. Fix: Possible fatal error when authorizing LinkedIn on PHP 7.1. Tweak: Use new delete icon for Facebook and LinkedIn. New: Add support for beta versions. Fix: Possible PHP notice when building share message. Fix: Trashing posts with shares caused PHP warnings. Tweak: Updated plugin updater class to newest version. Fix: Existing Twitter character counts were not loaded on initial editing of a post. FIX: If local tokens file is empty, fallback to licensed tokens. FIX: Old upgrade routine showing on initial installation. New: Allow duplicating an existing Tweet. New: Improved meta box UI with new icons. New: Save the share_id to the logs as post meta. FIX: Remove support for Bit.ly avatar. FIX: Incorrect scope for LinkedIn when using custom API Tokens. FIX: Update Twitter character counts to ignore images when warning of Tweet length. FIX: Translation updates and corrections in some missing textdomains. FIX: Fixed Bit.ly authorization not showing invalid password error. FIX: Scheduled shares can sometimes be marked as past-share on Facebook and LinkedIn. NEW: Added a filter for UTM Tag contents to allow customization. FIX: Delete action from schedule removes post meta but not scheduled event. FIX: Scheduled Tweets can sometimes be marked as past-share on Twitter. FIX: On existing posts, removing Share on Publish and changing the post status to Publish in the same action will cause the share to be sent. FIX: Twitter not always allowing deleting rows. FIX: Remove extra word 'within' from LinkedIn and Facebook expiring authentication messages. FIX: First scheduled tweet inputs can be falsely marked with past-share class when using timezones and or greater than GMT. FIX: Twitter - Card description missing when no excerpt provided and fallback is used. FIX: Possible fatal error if WP_Logging class is already declared. NEW: You can now set your Facebook and LinkedIn shares to be on a schedule instead of just at publishing. NEW: Notices for Facebook and LinkedIn authorization expiration are now dismissible. NEW: Your past Tweets are now 'hidden' when editing a post, and can be toggled to show or hide, saving space in the editor screen. TWEAK: Updated image thumbnail sizes for Twitter, LinkedIn, and Facebook to meet the new standards. TWEAK: Improved the plugin self-updater to be more efficient. TWEAK: All API calls are now stored using the WP_Log class, allowing for easier debugging. FIX: Sometimes presented with an 'invalid argument' when no Tweets are configured for a post. FIX: Re-authentication dates keep increasing as time goes for Facebook and LinkedIn. FIX: If WP_Cron is missed, there is a potential for many missed Tweets to go out at once. Only send if it's within an hour. FIX: Twitter description meta tag was dependent on the post_excerpt. FIX: Twitter character count colors were inconsistently changing. FIX: Scheduled shares were being recreated upon update if they were previously deleted. FIX: Better functions to identify when social networks were connected. FIX: Correcting an issue with the text of an override with no text.